Posted on Wednesday, January 12th, 2011 at 7:30 pm. Kollaboration DC & Chinatown Community Cultural Center presents: An Acoustic Performance with DC’s own native daughter to the DC Metro Area. 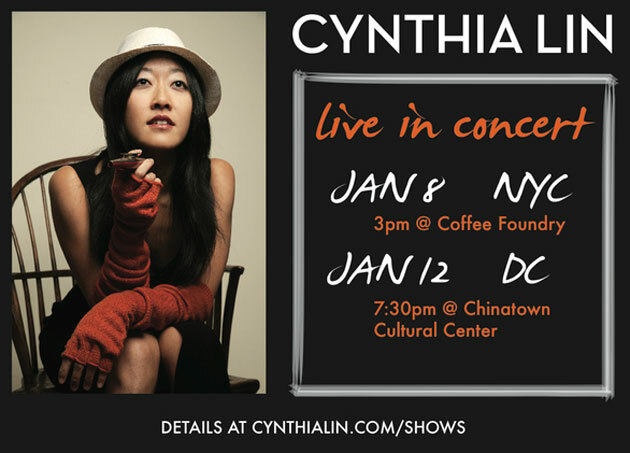 Drawing comparisons to Edith Piaf and Joni Mitchell, currently based in San Francisco, singer/songwriter Cynthia Lin captivates audiences with a rich, outsized voice and witty, honest storytelling. Since 2003, Cynthia has released three albums independently and toured colleges and venues across the country, having been in the DC, Chicago and NYC areas. Her first album Blue and Borderlined was featured on NPR’s Open Mic series, and her second album Doppelganger was named one of the Top 5 Asian American Albums of 2007 by AsiaXpress.com. The uncommon blend of retro jazz with acoustic fingerstyle guitar and a bluesy vocal delivery makes Cynthia’s style unmistakable yet classic. On her latest album Microscope, released in October 2010, Cynthia takes full artistic ownership; she recorded, arranged, engineered, mixed, and produced the nine-song collection, which includes three reinterpreted covers. The songs revolve around escapism, longing, hope, and ultimately self-discovery; the stories range from an overseas travelogue (Holiday) to an activist rally song (New Day) to a look at oneself through the eye of another (Microscope). The album is available exclusively cynthialin.com in multiple formats, including digital download and deluxe packages with a hand-letterpressed recycled cardboard CD case, printed by Cynthia herself. A true “Kollaborator”, Cynthia is performing for Kollaboration DC to help kick off the 2011 Year and Kollaboration DC’s 2nd Annual Competition Showcase! Please come out for some great music and talent as we usher in 2011 and the vision of empowering others through entertainment! Kollaboration DC is an all-volunteer, not-for-profit talent competition that brings awareness of Asian American talent to the DMV.